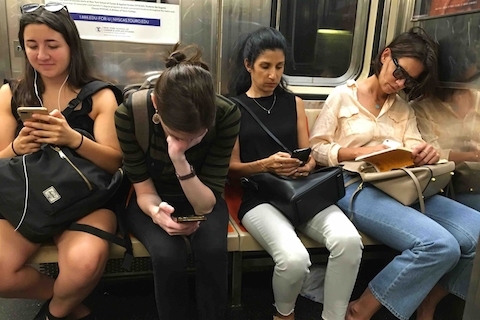 Commuters got on and off the subway train headed uptown in Manhattan and they were all very busy on their phones. If they weren’t so self-involved they might have noticed they were sitting near a movie star. And the movie star – Katie Holmes– is the only one reading a book instead of staring at her phone! Apparently phone addiction makes it much easier for celebrities to go about their business doing everyday things unnoticed! Seems like every time we get some news about Match Point star Jonathan Rhys Meyers, it ‘s all about a drunken outburst at an airport. He’s been in and out of rehabs fighting alcohol and anger issues and both problems are exacerbated when flying. During his last incident starting in Miami he reportedly waved wheelchair passengers out of the way and insisted on boarding first because he was “a first class passenger.” A witness said that during the flight he consumed drink after drink, visited the bathroom over and over, and was so inebriated that he didn’t notice that his pants fell down. Then he pulled out an e-cigarette and when his wife begged him to stop he cursed her and told her he wanted a divorce. Police met him when the plane arrived at LAX and his wife Mara made excuses for him (?) and apologized profusely. He didn’t get arrested, but we pity that wife. And after four or five of these abusive “incidents,” why hasn’t he been banned from flying those airlines?